Team Work Fencing Contractors provides custom fencing services in Wangara, Western Australia. Our Perth-based fencing company provides professional fence installation and repair services geared towards commercial and industrial property owners in Wangara that require high-quality fencing solutions. In the fencing business for over a decade, our specialist contractors install, repair and maintain chain mesh fences, palisade security fences and Garrison fencing in Wangara, as well as decorative fencing, agricultural fencing and more. Our goal? 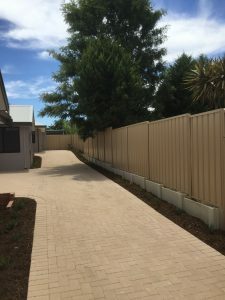 To professionally cater to the commercial fencing needs of property owners in the City of Wanneroo quickly and affordably, while offering personalised service that is second to none. For homeowners looking to upgrade the privacy, security and looks of their properties, Team Work Fencing Contractors also offers a complete range of residential fencing services. Our veteran contractors are experts at installing and repairing pool fences, HardieFence™, timber fencing, brush fencing, vinyl fencing and COLORBOND® fencing in Wangara, WA. We also do aluminium slats in Wangara and retaining walls. Want to add additional fencing features to increase the security of your home or business property or perhaps just improve its appearance? We can handle that, too. TWF can add a variety of enhancements to protect your loved ones and assets, including cladding, barbed or razor wire, toppings and supplementary panels and materials, along with other extras. Just let us know your fencing requirements. If it’s fencing related, then Team Work Fencing Contractors can make it happen for your home or business. Call us at 08 9795 3447 to find out how we can help you. Or, request a quote to learn more about pricing and services.